Adam has just finished playing the male lead in The Snow Queen at the Gaiety Theatre. 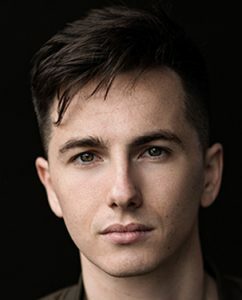 He is a classically trained actor having graduated from DIT’s Conservatory of Music and Drama with a BA (Hons) in Drama Performance in 2016. Upon graduating, Adam began work with “Find Your Way Home – an Irish Musical” which premiered in Dublin before then embarking on it’s U.S tour in the summer of 2017. In December of 2017, he began work on a new musical “Flynn” which ran in Dublin’s the Peacock Theatre. More recently, Adam worked with SQUAD theatre company on 2 productions; “Hashtag Relationship Goalz” & “Are You Lonesome Tonight?” for which he was nominated for Best Actor at Dublin’s IDGTF. Theatre credits during his years of study include: Lesley in The Hostage directed by Susan Kennedy, Wolfe in Subterranean; a collaborative short film directed my Peter Mc Dermott, Caesar in Julius Caesar directed by Miriam O’ Meara and Nurse Moriarty in Peter Sheridan’s The Big House. Subterranean Wolf Peter McDermott D.I.T. Find Your Way Home Daniel Christine Scarry Red Alchamy Th. Co. The Hostage Lesley Susie Kennedy D.I.T. Julius Caesar Julius Caesar Miriam O'Meara D.I.T. B.A. Honsours Degree in Drama and Performance. D.I.T. 3 yrs. Camera Acting and Casting – Darren Thornton and Louise Kiely.